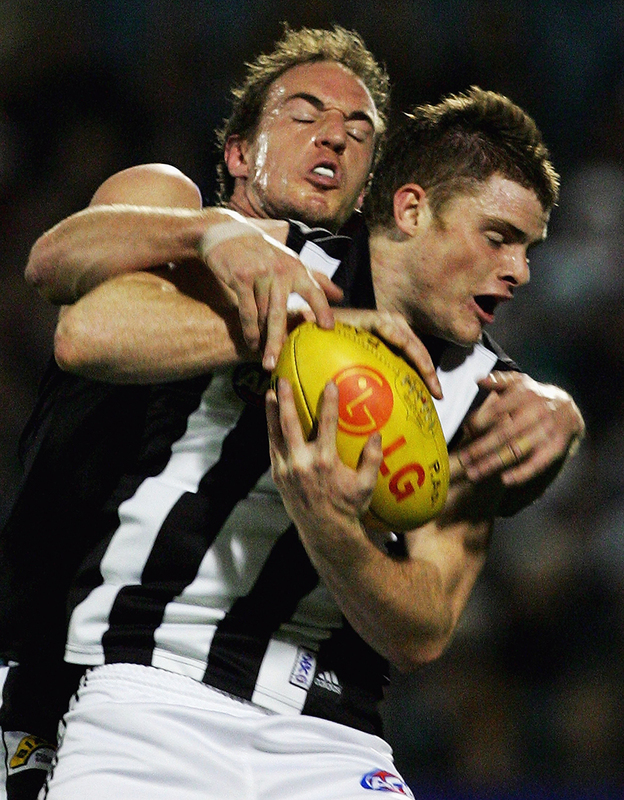 "This is the game right here"
Alan Didak, Nathan Buckley and Brodie Holland, three key figures in Collingwood's two-point win over Port Adelaide in round 20, 2006. Alan Didak had never experienced a moment like it; even if the thought had crossed his mind since he was a kid. He had the ball about 35m out from goal with less than a minute remaining. His kick would likely determine the outcome of a match, but also whether his team could lock in a finals spot. Time was running out. It was round 20, 2006, and Collingwood trailed Port Adelaide by three points when a neat chip kick from Anthony Rocca landed in Didak’s arms. It was one of the few times he had been able to get away from his shadow, Dom Cassisi, on a night at AAMI Stadium that had more than 30,000 fans on the edge of their seats. Didak, playing his 99th game, had the ball, but would he have the nerve to seal the deal? The scenario was simple. Kick the goal and it was almost certain that Collingwood would score a remarkable come-from-behind victory; miss it, and he would be seen to be responsible for a game that got away. This match was always going to noteworthy for a number of reasons. For Port Adelaide, it was meant to be Gavin Wanganeen’s farewell match as a player. But a knee injury brought an end earlier than he had intended. 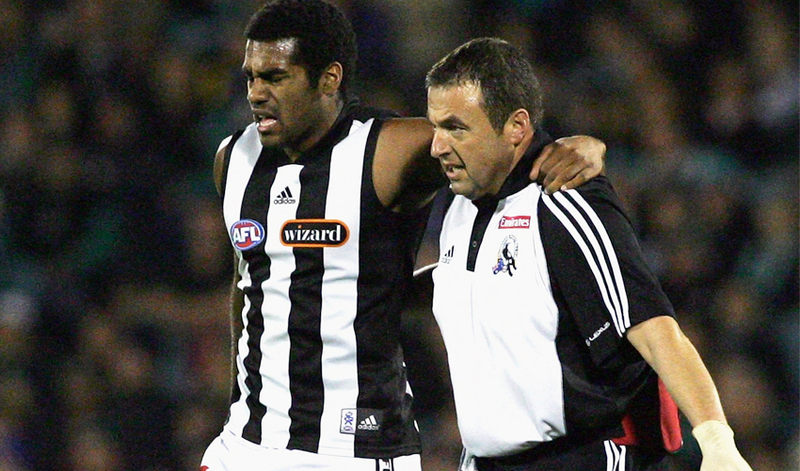 Heritier Lumumba leaves the field with an injured leg, early in the night. Nathan Buckley wasn’t saying goodbye yet. But as fate would it, this would be the final time he would play against Port Adelaide, a franchise that had courted him unsuccessfully when it was sought to join the AFL in late 1996. He knocked them back, and stayed loyal to Collingwood, and this particular night, he was also creating a part of Black and White history. The 34-year-old skipper, in his 273rd AFL match, was breaking a long-standing club record that stretched back to the 1934 season. On that night Buckley passed Syd Coventry‘s record of 153 games as Collingwood captain, and his match would be defined by one moment in the last quarter that kept his team in the contest when it looked over. Collingwood started well, kicking six goals to three, to lead by 19 points at the first change. Injuries to Heritier Lumumba (then known as Harry O’Brien) and Shane Wakelin were a concern though. Two of the Magpies’ opening term goals came from eighth-gamer Sean Rusling who looked unstoppable for a period of time. He would end up with three goals for the match. By halfway through the second term, the difference shot out to 33 points, after the extremely busy Ben Johnson slotted through a nice goal. But then things tightened considerably. The Power had cut the margin back to 10 points at half-time. And when the Magpies failed to score goal during the third term, things were beginning to look bleak. Port Adelaide led by seven points headed into the final term and with the support of the parochial South Australian crowd behind them, it was going to be a real challenge for the visitors. Sean Rusling kicked three goals from five scoring shots. Strangely enough, Buckley started the final term on the pine. Goals were hard to come in the final term. Port Adelaide couldn’t nail one, and Collingwood found it just as difficult. The Power was nine points in front with four minutes left, as the goal drought rolled on. It was left to Buckley to break the deadlock. Shifted forward, he launched on the back of Troy Chaplin and dragged down one of the best marks he had taken in his career. Heath Shaw won a team-high 33 disposals and earned two Brownlow votes for his troubles. Dennis Cometti screamed: “Buckley, what a mark by the champ.” From point blank range, he did not miss, and the game was suddenly alive. It was a skipper’s goal on the night he broke the club captaincy record. The difference was three points with less than four minutes left. Scott Burns was just as important as Buckley in the last term. He went back against the flow of play to drag in a courageous mark, but soon after missed a chance to steal the lead back, to the frustration of his coach. Stuart Dew had kicked the ball across goal. Burns intercepted, but inexplicably missed – hitting the post – from just metres out. Vision of Mick Malthouse slamming his hands on the desk in the coaches’ box, and then flinging off his head-set and leaving his seat in frustration showed just how tense the moment was. The ball ended up at the other end, with Brett Ebert having a shot at goal as the time remaining went under two minutes. His shot fell short, but Chaplin snapped a behind, with the difference now three points. This provided Collingwood one last chance with 85 seconds left. The Magpies got the quick escape and took the ball around the boundary line towards the attacking zone. A Chaplin punch pushed the ball loose to half forward, with Johnson handballing off to Rocca. A clever kick found the right target. Garry Lyon declared on Channel Nine: “This is the game right here” as Didak moved in and slotted through the match-winning goal with cool aplomb. The Magpies were in front with only 19 seconds remaining. Didak gestured to the crowd in delight, in the crowd President Eddie McGuire leapt from his seat and Malthouse almost signalled the goal from the coaches’ box. But it wasn’t the end of the drama. The centre bounce saw Burns gather the ball on the ground and shoot off an errant handball. It ended up with Brendon Lade who barrelled the ball deep into attack. The ball sailed long, but deviated late to go through for a behind. The siren sounded and the Pies had won a remarkable match by two points. James Clement arrives in the nick of time to spoil Chad Cornes. “He sacrificed a lot of his own play to tie up a few of the defensive mechanisms of Port. It’s probably fitting at the end that he was able to slot one through. The jubilant Collingwood players got to re-live Didak’s goal and Malthouse’s mini-meltdown when they watched the last few minutes in a small meeting room deep beneath AAMI Stadium after the game. “When we were watching the replay in the rooms, I was thinking that in my whole football life I had never had a kick after the siren or even just before the siren to win a game,” Didak said. And so it remains in the minds of Collingwood supporters.